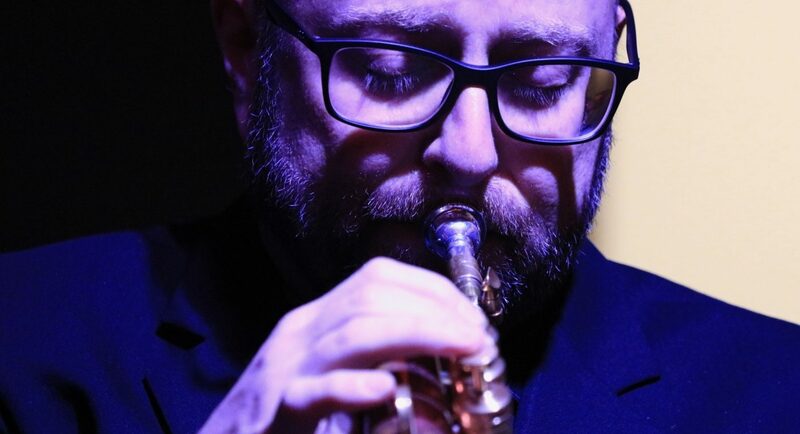 Dr. Scott Belck currently serves as the Director of Jazz Studies, the Division Head of Ensembles and Conducting, and Professor of Music at the University of Cincinnati’s College-Conservatory of Music (CCM) where he directs the CCM Jazz Orchestra and teaches applied Jazz Trumpet. He is a founding member of critically acclaimed Tromba Mundi contemporary trumpet ensemble and has toured as a member of Grammy Award winning funk legend Bootsy Collins’ Funk Unity Band as lead trumpet. He has served as trumpet and cornet soloist with the Air Force Band of Flight in Dayton, Ohio where he also held the post of musical director for the Air Force Night Flight Jazz Ensemble. He is the Founding the Artistic Director Emeritus of the Cincinnati Contemporary Jazz Orchestra. On Monday nights in Cincinnati, he serves as lead trumpet and musical director for the new Flying Circus Big Band featuring drummer “Baron” John Von Ohlen. His playing credits include recordings lead trumpet/guest soloist with the Cincinnati Pops featuring the Manhattan Transfer and John Pizzarelli, the Glenn Miller Orchestra, the Van Dells, and jazz soloist with the University of North Texas One O’clock Lab Band with whom he recorded four CDs as jazz soloist and section trumpet. He has performed as principal/lead trumpet with the St. Louis Symphony, Indianapolis Symphony, Cincinnati Symphony, the National Symphony Orchestra of the Dominican Republic, the Dayton Philharmonic Orchestra, the Lexington Philharmonic, the Richmond Symphony Orchestra, and as section trumpet with the Duluth-Superior Symphony Orchestra and the Duluth Festival Opera. He has performed as lead trumpet for shows/concerts of Christian McBride, Jimmy Heath, Aretha Franklin, Gerald Wilson, the Detroit Jazz Festival Orchestra, Linda Ronstadt, John Lithgow, Donna Summer, Maureen McGovern, Michael Feinstein, Lalo Rodriguez, Sandy Patti, Tito Puente Jr., Tommy Tune, Manhattan Transfer, Lou Rawls, Patti Austen, The Coasters, Yes, Ben Vereen, Doc Severinsen, the Temptations, Olivia Newton-John, Neil Sedaka, the Blue Wisp Big Band, the Columbus Jazz Orchestra, the Dayton Jazz Orchestra, the Ink Spots, the Four Freshmen, The Frankie Avalon, Fabian, Bobby Riddell, Little Anthony and the Imperials, Frankie Valli, The Maritime Jazz Orchestra of Canada as well as touring Broadway shows and regional and national recording sessions. He has performed as a leader, musical director, or sideman with many top jazz players on the scene today including: Fred Hersch, Rich Perry, Adam Nussbaum, Lew Soloff, Randy Brecker, Slide Hampton, Jim McNeely, Claudio Roditi, John Riley, Rick Margitza, Bob Belden, Jimmy Heath, Bobby Watson, Tom Harrell, Tim Hagans, Regina Carter, Wes Anderson, John Hollenbeck, Steve Turre, Conrad Herwig, Gordon Brisker, Hank Marr, Marvin Stamm, Gerry Mulligan, Kenny Garrett, John Fedchock, Phil Woods, Ed Soph, John LaBarbera and Diane Schuur. He has also served as the Artistic Director of the Dayton Jazz Orchestra, the Jazz Central Big Band, and the Miami Valley Jazz Camp in Ohio. He is the author of the text “Modern Flexibilities for Brass”, published by Meredith Music and distributed by Hal Leonard. In his spare time, he is the CEO and founder of Lip Slur World Headquarters. Belck’s new book “Progressive Lip Flexibilities for Brass” is quickly becoming one of the most popular sarcastic lip slur books in the lower South-Central Ohio River valley region. Scott Belck is a Powell Signature Trumpet Artist.